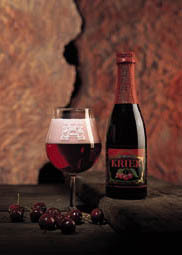 Kriek is a Belgian specialty, created from a lambic beer brewed with Morello cherries or the rare "Schaerbeekse" variety. Lambic beers undergo spontaneous fermentation from exposure to wild yeasts and lactic acid bacteria. The process produces lactic and acetic acids within the final product, which are often complemented by the addition of fruit flavors instead of hops. The name “Kriek” comes from the Dutch word for the cherry. Traditionally, a rod called a “stoemper” and a lump of sugar would be offered to those who drank Kriek in Belgian pubs. The customer could crush the sugar at the bottom of the glass to temper the sour flavor of the beer. Sugar is usually added to most fruit lambics on the market today to increase popularity among younger, less adventurous imbibers. "How could I add beer to this." The Cantillon Brewery produces an authentic Kriek, in which cherries are added at the beginning of fermentation. Lindemans uses a similar method, but adds the fruit once the beer has fermented for six months. The Italian Birrificio Del Ducato produces several lambic beers in the Belgian style, including La Luna Rossa, a yeasty brew for true lambic enthusiasts. For this week’s recipe I used Floris Kriek from the Huyghe Brewery out of Melle. The company was established in 1654, and celebrated their 350th anniversary in 2005. My family has a single Adam’s cherry tree in our backyard, producing buckets of sour cherries each August. A family of three can only consume so many cherry pies. We find other creative ways to use them – cherry barbecue sauce and cherry-infused grappa, among other things. Even then we have to dry more than half the harvest with a NESCO dehydrator. The dried cherries end up in trail mix, salads, and my baking projects. I’ve wanted to make a dessert with cherry-flavored lambic for quite some time. I told someone about my idea while out on a second date. He replied, “Why don’t you make normal chocolate cookies?” There was no third date. Why would I ever want to be “normal”? Preheat oven to 375°F (325°F in a convection oven). Combine sour cherries and beer in a small saucepan over medium heat. Once beer begins to boil, reduce heat and let simmer for 4-5 minutes. Remove from heat once all but ¼ cup of the liquid is absorbed. Add eggs and vanilla. Beat until smooth. In a separate bowl, combine flour, salt, baking soda, and cocoa. Add dry ingredients to creamed butter and sugar gradually, stirring vigorously. Add kriek-soaked cherries and reserved liquid and mix well. Fold in chocolate chips. For best results, chill the dough in a refrigerator overnight to solidify the butter. This gives the cookie more shape and prevents spreading. Scoop dough with a teaspoon and drop onto nonstick or greased baking sheet. Press each lightly with a spoon or the palm of your hand. Bake for 12-14 minutes or until edges are lightly browned. Cookies will be slightly risen, but will collapse upon cooling.